The Milk Carton Kids are an American indie folk duo from Eagle Rock, California, United States, consisting of singers and guitarists Kenneth Pattengale and Joey Ryan, who began making music together in early 2011. The band has recorded and released five albums: Retrospect, Prologue, The Ash & Clay, Monterey, and All the Things That I Did and All the Things That I Didn't Do. They are noted for releasing their first two albums for free. 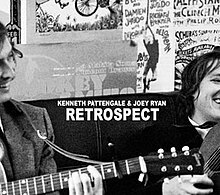 Joey Ryan and Kenneth Pattengale formed a musical duo after Ryan attended a solo performance by Pattengale in their shared hometown of Eagle Rock, California. The Milk Carton Kids came together after both artists had largely unsuccessful solo careers and had reached a professional crossroads. They released Retrospect, a live album recorded in Ventura, California in March 2011. Retrospect predates the band name, and was released under Kenneth Pattengale & Joey Ryan. After performing at SXSW in March 2011, The Milk Carton Kids joined Joe Purdy's North American tour as his opening act and backing band. The duo released Prologue on July 19, 2011. This was their first studio album and the first release under the band's name. The San Francisco Chronicle referred to Prologue as "bittersweet and beautiful." "There By Your Side" was named National Public Radio's Song of the Day. Prologue made Daytrotter, American Songwriter, and About.com year-end lists. Following Prologue’s release, the group headlined a North American tour. The group's second album The Ash & Clay was released on ANTI- records on March 26, 2013. Promotion for the album included touring with Austin-based artist Sarah Jarosz and a November taping of Austin City Limits. On May 19, 2015, the band released its album Monterey on ANTI- records. The album was well-reviewed, with Rolling Stone calling it a "beautifully realised folk recording" and Paste calling the album "exquisite". All the Things That I Did and All the Things That I Didn't Do was released on June 29, 2018 on Anti- Records. The Milk Carton Kids have performed on National Public Radio's Mountain Stage, Daytrotter, and were guest DJ hosts on Sirius/XM's folk channel The Village. The duo toured on July/August 2012 with Old Crow Medicine Show (supporting their new album Carry Me Back) and The Lumineers. The tour visited such cities as: Louisville, Cincinnati, Nashville, Richmond, Washington, D.C., Philadelphia, New York City, Boston, and Atlanta. In the fall of 2012, they toured America again with L.A.-based Leslie Stevens opening and in November 2012, they began their tour with the Punch Brothers. In December 2012, three unreleased tracks ("Snake Eyes", "The Ash & Clay" and "Jewel of June") were featured in Gus Van Sant's film Promised Land, starring Matt Damon and John Krasinski. They were also featured in T Bone Burnett & The Coen Brothers' concert film documentary, Another Day/Another Time: Celebrating the Music of Inside Llewyn Davis , alongside Joan Baez, Jack White, Gillian Welch, Marcus Mumford, Punch Brothers and many other folk luminaries and upstarts. After the 2013 release of The Ash & Clay they appeared on a number of TV and Radio performances including Garrison Keillor's A Prairie Home Companion, CBS This Morning, and Conan. On April 29, 2014 National Public Radio released a full concert DVD, Live at Lincoln Theatre. On April 11–12, 2014 they collaborated with Joe Henry and Over the Rhine for a two night live performance & recording of all new songs inspired by the Great American Songbook. An album of the collaboration may be forthcoming but no date has been set at this time. In October 2016, the duo joined the Lampedusa concert tour in the US in support of equal human rights for refugees. Ryan plays a 1951 Gibson J-45 acoustic guitar while Pattengale performs on a 1954 Martin 0-15. The Milk Carton Kids' 2013 album, The Ash & Clay, received a Grammy Award nomination for Best Folk Album of 2013, in addition to receiving a nomination for Emerging Artist of the Year at the 2013 Americana Music Honors & Awards. In 2014 they were selected the Americana Music Association Duo/Group of the Year. Both Prologue and Retrospect were made available for free download at the group's website. By the end of 2011, the two albums had been downloaded for free over 60,000 times. By February 2014 downloads had reached 275,000. "The City of Our Lady"
"Just Look at Us Now"
^ Everret, Matthew (2012-08-22). "The Milk Carton Kids Take Folk to New Highs and Lows". Metropulse.com. Archived from the original on 2013-01-28. Retrieved 2013-08-04. ^ "Gig Review: Joe Purdy and the Milk Carton Kids". Project Rhythm Seed. May 12, 2011. Retrieved March 10, 2019. ^ "iTunes - Music - Prologue by The Milk Carton Kids". Itunes.apple.com. July 19, 2011. Retrieved September 18, 2012. ^ Vaziri, Aidin (2011-08-14). "Why Milk Carton Kids are giving albums away". The San Francisco Chronicle. ^ Thompson, Stephen (2011-08-19). "The Milk Carton Kids: The Sweet Spot". NPR. Retrieved 2012-01-27. ^ a b "Daytrotter: The source for new music from the best emerging bands". 20 January 2012. Archived from the original on 20 January 2012. Retrieved 29 June 2018. ^ "The Top 50 Albums Of 2011: Honorable Mentions". American Songwriter. 2011-11-29. Retrieved 2012-01-27. ^ "Best CDs of 2011 - The Best Folk Americana and Bluegrass CDs of 2011". Folkmusic.about.com. 2011-12-12. Retrieved 2012-01-27. ^ "The Milk Carton Kids' Prologue Featured at". Performingsongwriter.com. 2011-08-03. Retrieved 2012-01-27. ^ "The Milk Carton Kids website". Themilkcartonkids.com. Retrieved 2015-05-14. ^ "The Milk Carton Kids". Themilkcartonkids.com. Retrieved 29 June 2018. ^ "The Milk Carton Kids: Just Plain Folk". Pastemagazine.com. Retrieved 29 June 2018. ^ Boilen, Bob (2018-04-17). "On The Verge Of An Epic Album, The Milk Carton Kids Share A Stunning New Song". NPR.org. Retrieved 2018-04-28. 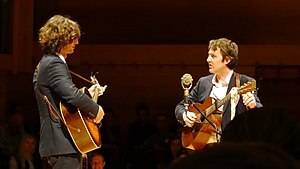 ^ "The Milk Carton Kids On Mountain Stage". NPR. Retrieved 2012-01-27. ^ "Yahoo! Groups". Launch.groups.yahoo.com. Retrieved September 18, 2012. ^ "Congratulations To Old Crow Medicine Show On Their Career High Chart Debut! - Nettwerk". 18 May 2015. Archived from the original on 18 May 2015. Retrieved 29 June 2018. ^ "Inside Llewyin Davis Concert". Insidellewyndavis.com. Retrieved 2015-05-14. ^ "The Milk Carton Kids on Prairie Radio". Prairie Home Public Radio. ^ "CBS This Morning, The Milk Carton Kids". CBS News. Retrieved 2014-07-22. ^ "The Milk Carton Kids "Honey Honey" 03/27/13 - CONAN on TBS". Team Coco, Youtube. ^ a b "The Milk Carton Kids, Live From Lincoln Theatre". NPR. ^ "Joe Henry + Over the Rhine + The Milk Carton Kids | Duke Performances". Dukeperformances.duke.edu. Retrieved 2015-05-14. ^ "Mericana Honors Awards 2013 Nominees Announced". Americana Music Association. Archived from the original on 2014-12-21. Retrieved 2014-03-27. ^ "Jason Isbell Wins Artist, Album and Song of the Year from Americana Music Association". Wall Street Journal. Retrieved 2014-10-01. ^ Guymon, Katie (January 25, 2012). "Pajammy Jam of the Day | The Milk Carton Kids - Michigan". Speakers in Code. Retrieved September 18, 2012. ^ "The Milk Carton Kids Perform Live on NPR's Mountain Stage". Tunes.broadwayworld.com. Retrieved 2012-01-27. ^ a b c d e Van Vechten, Carl (2011-04-25). "The Milk Carton Kids". LOC. Retrieved 2012-04-04. ^ > "Monterey". Apple Inc. Retrieved 2015-07-02. Wikimedia Commons has media related to The Milk Carton Kids. This page was last edited on 3 April 2019, at 20:34 (UTC).